You’ve landed the interview of your dreams. 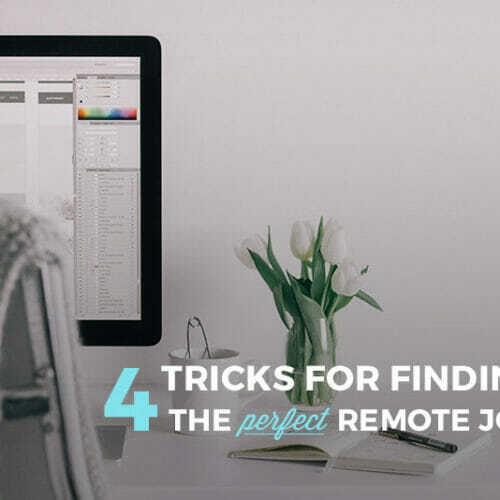 It’s for a remote job that pays more than you ever thought you could make working part-time (or maybe it’s for that international gig you’ve been daydreaming of). In short, you are over the moon! You’ve got this. Read on for a list of absolutely everything to do, from your tech setup to “designing your set,” to making sure you look and sound fantastic on your video interview. If you do nothing else to prepare for a video chat, do this one thing: use headphones. An echo ruins a video chat, fast. And lags in connection and internet blips can easily create an echo, delay, or other sound disruption that can be lessened with headphones. People will forgive your video quality, but they won’t forgive your sound. If the person on the other end can’t understand what you are saying, you’re in trouble! So, dig up those headphones that came with your first iPhone, or buy a pair of cheap headphones with a mic. (For example, Skullcandy makes a pair for $20.) Your sound will be crisper, the risk of echo will be reduced drastically, and those sirens and dogs barking in the background won’t get in the way of the great impression you’re making on screen! Note: even if you don’t have headphones with a mic, regular old headphones will work to reduce the echo as well. A sketchy set of headphones is better than no set of headphones. Most video chat systems require time to download either an application or a plugin. Do a quick search of the technology that your video interview is using, and see what you need to prepare. Two common (and free!) platforms to use are Google Hangout and Skype. 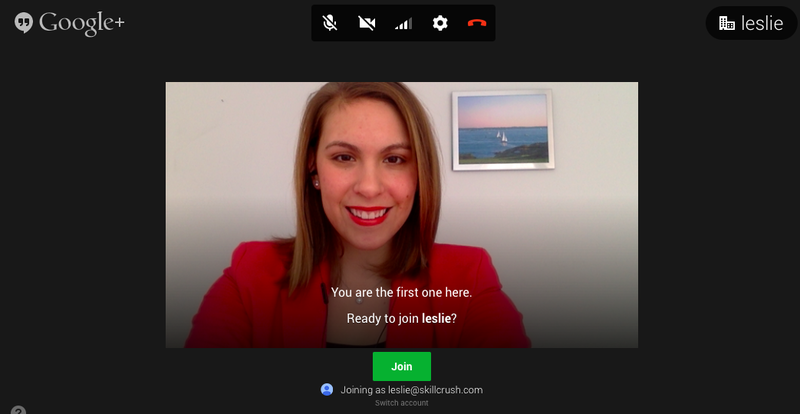 There is a quick plugin for Google Hangout that requires a browser restart (download here), and an easy application download for Skype (find your version here). 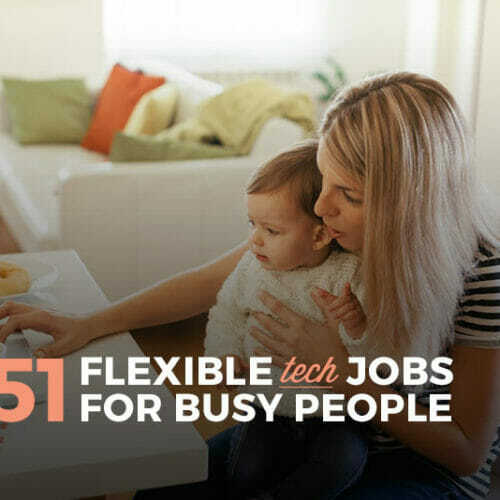 There are hundreds of other video platforms that you could use, such as Cisco WebEx and GoToMeeting, so setting aside 15 minutes before your interview to make sure you have the right tech downloaded will ensure you are prepared! Being on a video chat requires solid, fast internet speed. Starbucks Free WiFi just isn’t gunna cut it. Test the internet speed at the location where you are going to be joining the video interview by running a free test at speedtest.net. Google recommends an upload and download speed of at least 4 Mbps for a solid video connection. Also, wireless internet signal can fade in and out. If you have an ethernet cable handy (they usually come free with your internet router or you can purchase one on Amazon for less than $10), plug it in to ensure you have a steady connection. Do a quick check of your sound settings to make sure everything is set correctly. 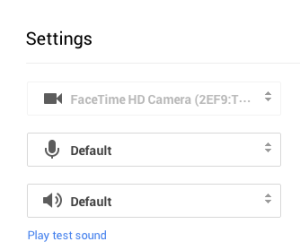 Every video chat system has slightly different settings, but most will default to “built-in audio,” which means the speakers and microphone on your computer. If you are using headphones and there is an option to set to your headphone audio (and microphone) instead, click it! On Skype, you can try speaking and watch the audio bar rise and fall with your volume. 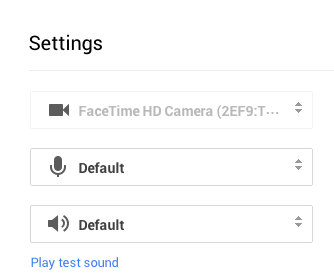 If you are using Google Hangout, try playing a test sound to make sure you can hear in your headphones. Video drains your battery more than nearly any other program you can run on your computer. If you are taking your video interview using a laptop or tablet, charging it to 100% is a great idea. An even better idea is to have your laptop plugged in! Sort through your closets and find an extension cord if you need it so that you can be in the best position and not run out of juice in the middle of your call. Actively think about setting up what is behind you in the shot for your video interview. As executive recruiter Jennifer Johnson shared, being in a big room and having too much depth behind you can be distracting. It’s best to position yourself a few feet from a wall, and have one or two tasteful decor components in the background. For example, a painting, a plant, or an organized bookshelf. 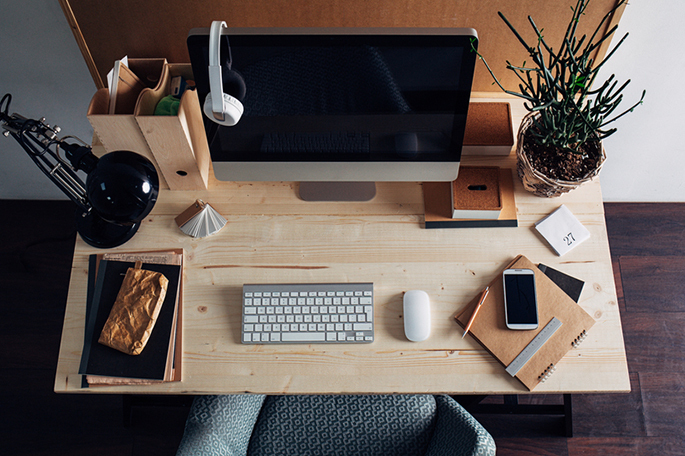 Imagine meeting with the CEO of a huge company, and think about what how their desk is positioned: try to create the same setup for yourself. A white wall absolutely works, but if you have the time to “design” your set, it can certainly boost the impression you make! “It looks like I have a double chin!” That was Laura Belgray’s reaction when we started to set her up for her fantastic Skillcrush webinar. You know what she’s talking about: you look down at your laptop, while your chair has you perched up high, and the camera hits you at possibly the least-flattering angle of your neck you’ve ever seen. Prop your laptop up so that you are looking at the camera at eye level, instead of down. Use a few textbooks, a pile of magazines, or even a rectangular tissue box to set your laptop up a few inches on your desk. It makes you look relaxed and composed, is a more flattering angle, and saves you from neck cramps. A cardinal mistake of newbies on video interviews is to have light shining from the background. If you have a big window with a view, why not show it off? Doh! You want the (spot)light on your face, not on the background! Think about getting your school pictures taken (I know, I know, terrible memories of braces. But bear with me on the analogy…). Where did that huge, blinding flash come from? Directly in front of you! So when you setup your video interview or chat, think about your school pictures and place your lighting in the front. Natural lighting is best, so face towards a window if you can. 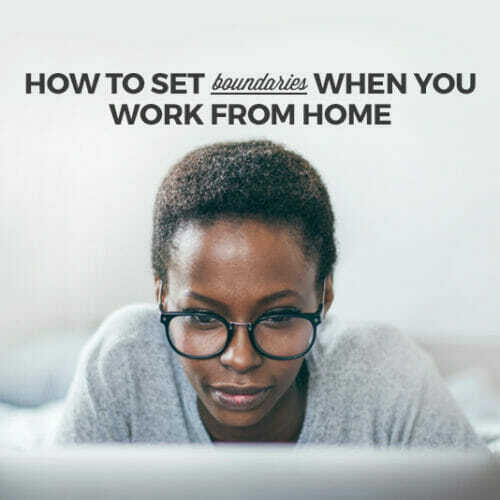 If you are in a darker room, or you are getting on video chat in the evening, find a lamp that you can plugin and place about a foot in front of your laptop to give you some good lighting. (Just relying on the lighting from your laptop might give an eerily creepy glow…) If you have the time, take the extra step and take away, turn down, or turn off the lights behind you, as well. To show you just how important light can be for the professionalism of your set, I took a few screenshots so you can see how Google Hangout responds to light. Which one do you like best? With the focus adjusted, you can see me on camera, but I’m a little fuzzy (almost ethereal!?) because of the light behind. Aha! The light coming from the window in front of me makes for a crisp, clear, and professional video chat image. Before you go live, make sure to check that your video camera works and that you look great on screen! But, you don’t want to login to your interview while you’re checking your setup. Instead, use another program to see how you look before going live. The easiest way to test how you look is the audio/video settings in Skype. Once you open up Skype, click “Preferences” from the menu and open up the Audio/Video tab. Your camera will turn on and you will see yourself! 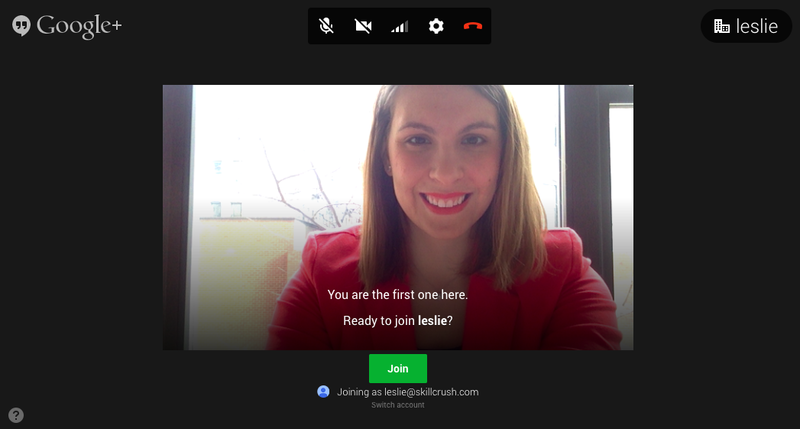 If you don’t have access to Skype, there’s a great workaround for testing out how you look on Google Hangout. 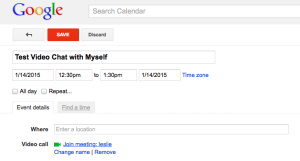 Pop into Google Calendar and open up a meeting invite. 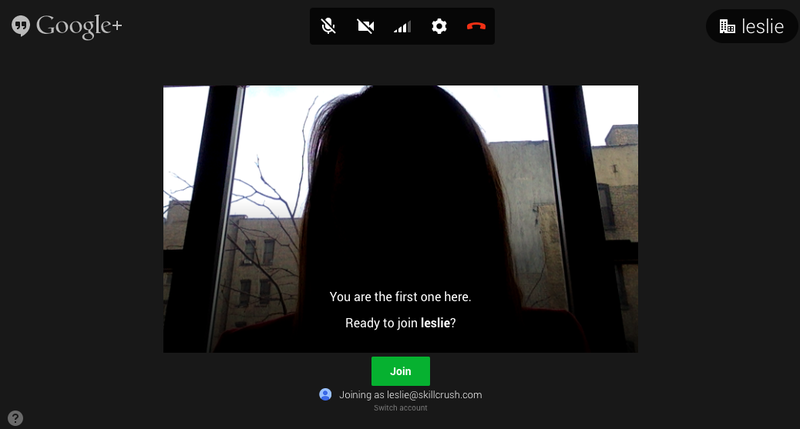 There is an option to join by Video Call (see the bottom field in the screenshot below). 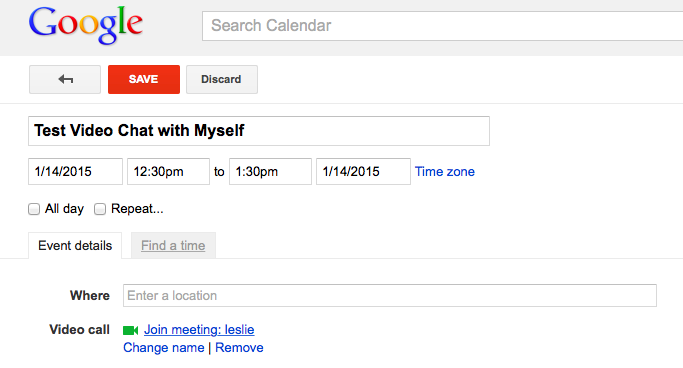 Click that, and you’ll open up a Hangout with yourself. The best way to know that everything will work correctly is to do a test run! 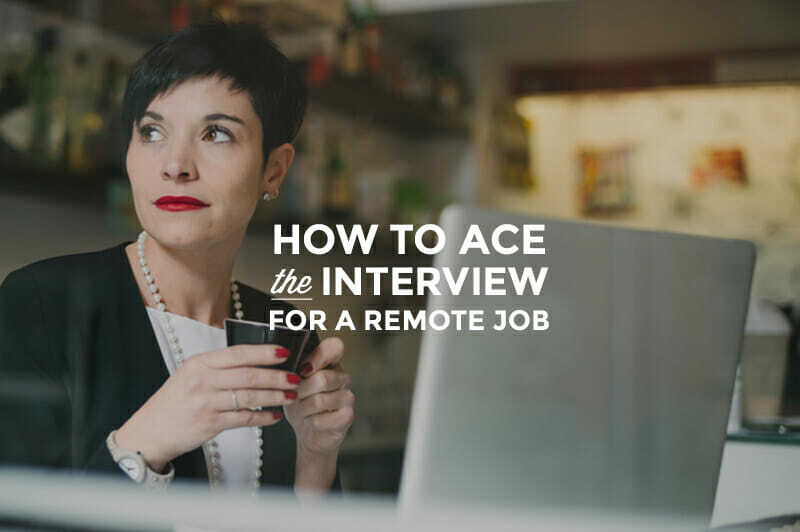 Try out the technology you are using in a test call before your interview or chat starts. Setup everything as close to the way you will do it on interview day to make sure you have all variables under control. Quick tip: haven’t talked to your roommate from college in a while? Instead of giving her a call by phone, see if she’s up for jumping on a video chat! You get to test your sound and audio so you feel confident that it works, and catch up with a great friend while you’re at it. Bright colors look amazing on video. Avoid wearing stripes, paisley, and the like, as the detail can come across as fuzzy and distracting on video. (Ever notice how the best dressed at Hollywood awards shows are usually the solid, bold colored dresses, and the outfits that crash and burn are often patterns?). Particularly outstanding colors for camera include scarlet red, emerald green, and royal blue. Pick your favorite! Good day! I could have sworn I’ve visited your blog before but after looking at many of the articles I realized it’s new to me. Anyways, I’m definitely delighted I discovered it and I’ll be book-marking it and checking back often! Good day! I simply wish to give you a huge thumbs up for the great information you have right here on this post. I am coming back to your site for more soon. Hiya, I’m really glad I’ve found this info. Nowadays bloggers publish just about gossip and net stuff and this is really irritating. A good site with exciting content, this is what I need. Thank you for making this web-site, and I will be visiting again. 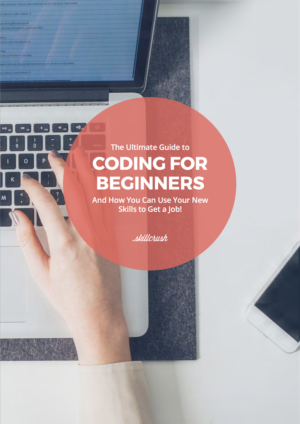 Do you do newsletters by email? Good tips for interview candidates.